In 2015, President Barack Obama called a carbon tax “the most elegant way” to fight global warming. France just suspended carbon taxes on fuel after riots roiled Paris and other major cities. Protesters angered by the carbon taxes demonstrated for days and called on President Emmanuel Macron to resign. Almost three years ago to the day, former President Barack Obama told reporters at a press conference in Paris “the most elegant way” to fight global warming was taxing carbon dioxide emissions. “I have long believed that the most elegant way to drive innovation and to reduce carbon emissions is to put a price on it,” Obama said at the 2015 United Nations summit that led to the Paris Agreement. 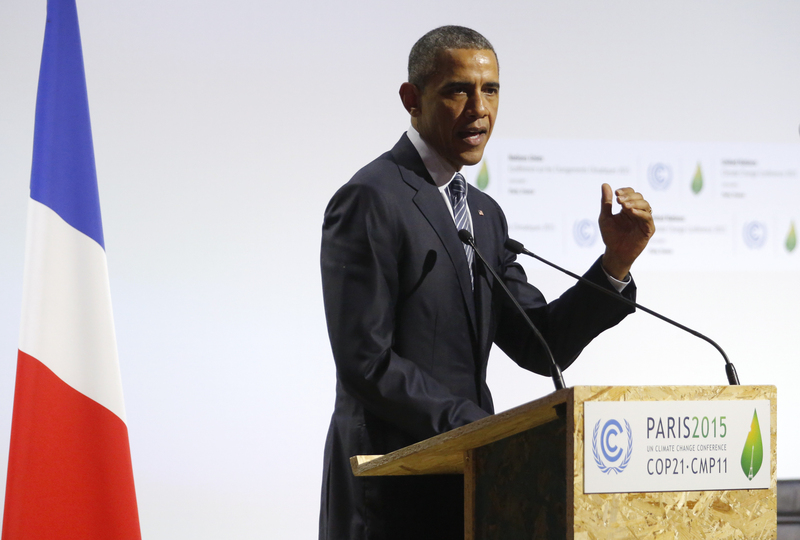 U.S. President Barack Obama delivers a speech on the opening day of the World Climate Change Conference 2015 (COP21) in Le Bourget, near Paris, France, November 30, 2015. REUTERS/Stephane Mahe. The French government announced Tuesday it would delay implementing a carbon tax on diesel and gasoline after protests swept the streets of Paris and other major cities in opposition. The tax increases were meant to reduce oil consumption and raise money for green energy projects, all in the name of fighting global warming. Tens of thousands of gilets jaunes, or “yellow vests,” rose up against the planned tax increase in late November, sparking wider protests across the country. 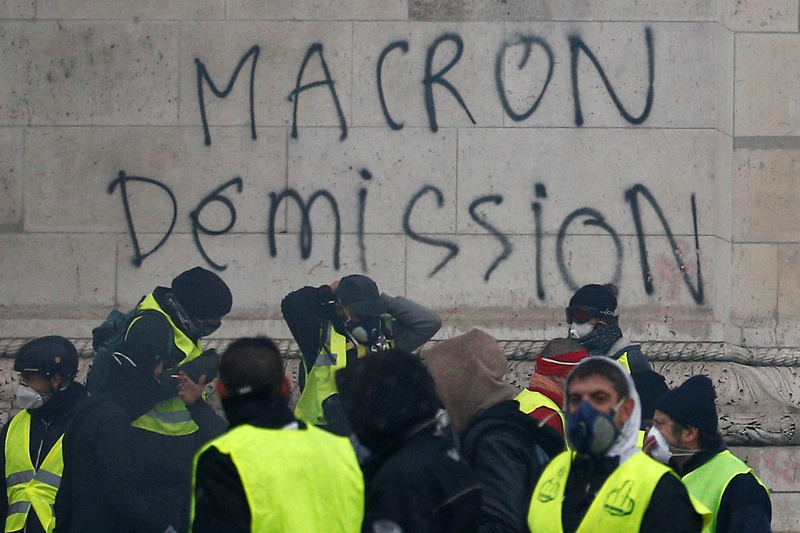 Higher fuel prices were the final straw for thousands of “yellow vests” already being crushed under rising energy and housing costs. Initially, Macron resisted calls to scrap the carbon tax, one week ago arguing that “we have to say that we have done too little” to fight global warming. 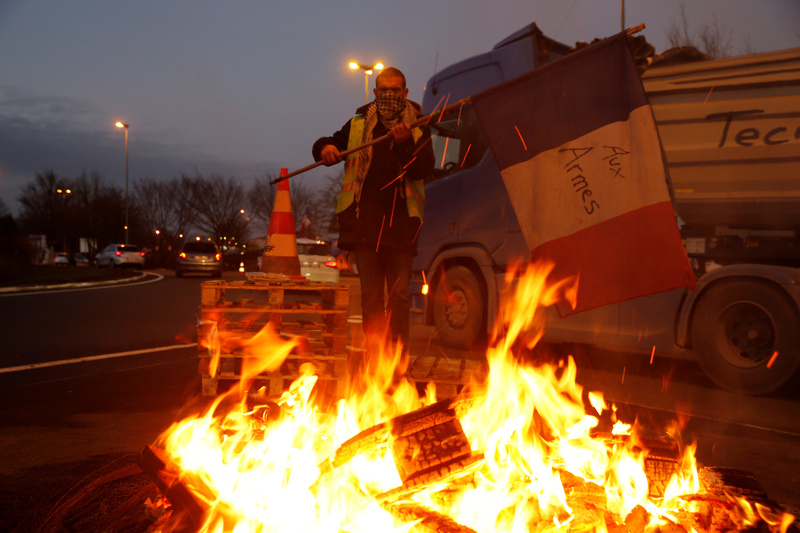 A protester wearing a yellow vest, the symbol of a French drivers’ protest against higher diesel fuel prices, holds a flag near burning debris at the approach to the A2 Paris-Brussels Motorway, in Fontaine-Notre-Dame, France, December 4, 2018. REUTERS/Pascal Rossignol. However, the Macron government has now decided to delay implementing the fuel tax another six months. The delay is seen as a win for the “yellow vests” opposed to the carbon tax. “No tax is worth threatening the unity of the nation,” Prime Minister Édouard Philippe told reporters Tuesday. The carbon tax was supposed to kick off at the start of 2019. Taxes on diesel would increase about 28 cents per gallon and gasoline taxes would increase 12.5 cents per gallon. That may not sound like a lot, but Macron’s government this year already raised taxes on diesel by 33 cents per gallon and gasoline by 17 cents per gallon. The average cost to fill up your tank in France runs just under $7 per gallon, but 60 percent of that cost is from taxes.